Why is there still a need for Black History Month? Our panel of experts listed the continuing removal of black contributions from American history, America’s fear of black men, and the whitewashing of Detroit as just a few reasons. Ambassador Magazine Roundtable – Jan/Feb 2015 Group Photo by Andrew Potter. 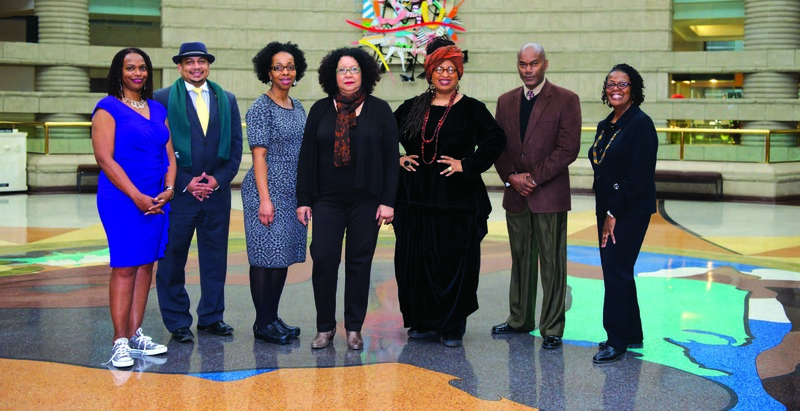 Left to right: Satori Shakoor, Ken Harris, Kidada Williams, Valerie Mercer, Marsha Music, Paul Rogers, Deborah Smith Pollard, (not pictured) Juanita Moore. The January/February 2015 Ambassador Magazine Roundtable convened at a pivotal moment in American history – and in the history of Detroit. As we gathered to discuss the importance of African American History Month with an esteemed group of historians and scholars, race occupied the center of our national conversation. The public erupted into spontaneous protest after a series of high-profile killings of African American men and boys by police, highlighting the longstanding American tradition of police violence against the black community. And instead of ushering in a post-racial era in America, racial tensions were intensified and will forever color the legacy of Barack Obama – the country’s first African American president. Hashtags and slogans like #BlackLivesMatter, #ICantBreathe and #WhitePrivilege peppered social media and the nation’s consciousness. Closer to home, as a resurgent Detroit emerged from the largest municipal bankruptcy in U.S. history – forever the phoenix shaking off the ashes – questions and accusations surrounded the complexion of the city’s latest renaissance. Was there room in the whiter, more affluent “New Detroit” for the city’s majority population of working-class African Americans? Efforts to promote Saxappeal’s 2009 debut album “Stay Saxy” were often rebuffed by smooth jazz radio programmers who judged it “too urban” for their stations. That was good news. That first album by Saxappeal, also known as LaDarrel Johnson, blends hip hop and new soul sensitivities with a sultry contemporary sax sound that is meatier and more adventurous than typical smooth jazz fare. The prominence of the horn, however, ensures that Saxappeal’s music won’t be played on most R&B, urban contemporary or hip hop stations, where all songs must feature singing or rapping. My name is Nadir, and I’m an addict. I’ve been addicted to playing music for a very long time. And being addicted to music is like being addicted to crack. Okay. I’ll confess. I’ve never smoked crack. …The high of creating in the studio. When the song is strong, and the rhythm track is hot, I catch a buzz. All of a sudden I start dancing uncontrollably in the middle of the control room. I feel like I’m stoned. I’ve had some success with the work I’ve produced for myself and other artists – awards, radio play, international tours, licensing for movies and advertising, scoring indie films and more. Each accomplishment brings new validation. But if you’re really passionate about your music as I am, you don’t do it for the money or the acclaim. You do it because you’re addicted to the rhythm. In his bestselling book, This is Your Brain On Music, music producer/neuroscientist Daniel J. Levitin explains that the neurotransmitter dopamine is released into the pleasure centers of the brain when we listen to music we enjoy. Dopamine is most famous for its role in the brain’s pleasure and reward system. It is involved in mood regulation and coordination of movement. On top of that hit of “dope”, when I’m playing music that I like, on an instrument I enjoy, with a tone that is pleasing, I begin to care, and I pay more attention. Levitin’s studies show that dopamine is released again, enhancing emotions, alertness and mood. My brain creates a neurochemical tag for every aspect of the experience to make sure I remember what this buzz feels like. So if I’m really excited about this 16 bar verse I’m spitting, and the hook is hot, and the beat is knocking, my brain could be infused with enough dopamine to pack a Phillie blunt. If I’m truly passionate about my music, if I’m feeding on the energy of a crowded club or a packed arena, and I’m on, the high can be like taking a hit of freebase cocaine. Okay, the science isn’t perfect, but I do know that the more I get that feeling of playing great music, the more I want to feel it. I’ve gotta have it… every day, all day, all night, if possible. I keep chasing that high, hoping for the same feeling or a better, more intense high. And that’s why I will never quit. It’s not because the pay is great, that’s for sure. Even major label artists struggle to make ends meet. The rest of us make due with day jobs or odd jobs or, if we’re lucky, jobs playing music for a living. Those artists who are most successful are driven like crack heads. The difference is they know how to balance the business with the buzz. They create a lifestyle that allows them to get high by playing as much music as possible, while keeping the bills paid, and (puff, puff) passing the feeling on to others who get a dopamine infusion when they hear music they enjoy. So yes, I’m a professional musician and producer. I’m in control. But the first step to control is admitting that I’m an addict, and music is a drug that I will never quit.